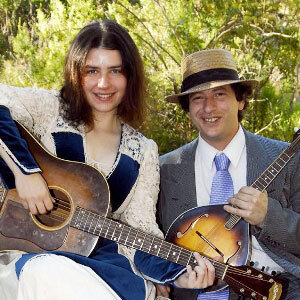 Singer Meredith Axelrod and multi-instrumental virtuoso Craig Ventresco will perform their repertoire of ragtime, early jazz, blues and pop tunes from the 1890s to the 1930s. Craig plays mandolin, guitar, and ukulele, and Meredith sings and plays guitar and ukulele. "Guitarist Craig Ventresco may be one of the best ragtime pickers alive today. Ventresco's ability to perform rags by Big Bill Broonzy, Eubie Blake, and Scott Joplin is awe-inspiring; his dense arrangements sound impossibly difficult to play, but they are a sheer pleasure to hear. It may be sacrilegious to admit, but Ventresco's technical ability is right up there with Blind Lemon Jefferson and Blind Blake-the only things missing are the pops and hisses of the 78s."